The Operational Area (AO) for our purposes is going to be the area we primarily defend PLUS areas of interest connected to it. An Area defense is a defense that encompasses just that – an area. A point defense for our purposes is a static location – i.e. your homestead. We’ll get into point defenses much later on. For now lets concentrate on Areas. I’ll tell you right up front – this is not word for word .mil terrain assessment or IPB – that’s not the point here. The IPB is a complex process and this draws elements from it however to go into the IPB would be a complete waste of time when you could read an FM. This is presented as an educational tool for the complete novice. Observation and Fields of Fire: You want standoff that gives you observation and unobstructed fires beyond the range of a threats ability to bring observation or unobstructed fires upon your AO or point defenses. Key Terrain: Key terrain is ground you must hold to protect your point defenses, ground you can fall back to if things turn bad, and ground usable by a threat to marshal and stage in prep of an assault on your AO. Avenues of Approach: What roads, trails, pipe/power lines lead into your AO? Anything that is passable is a possible avenue of approach. Rather than worry about every goat trail concentrate on two types: High speed (passable by a vehicle) and unobstructed. A high speed avenue of approach can be anything form an interstate or state highway, county road, or improved trails that a vehicle can quickly enter or exit your AO. An unobstructed avenue of approach is a path that dismounted or all terrain type vehicles (i.e. ATVs/UTVs) can enter your AO. It typically isn’t easily passable by either and would require considerably more time for a threat to infiltrate or exfiltrate your AO. Obstacles: An obstacle is anything that can deny freedom of movement to a threat. There are generally two types of obstacles we’re going to focus on – those that are counter vehicle and counter man. Natural bodies of water deeper than 8 feet are excellent obstacles. Heavy thickets generally will deny any vehicular movement. Steep slopes, cliffs, and other formidable terrain can be an obstacle. Also look at natural choke points (areas that a threat must cross that forces them to concentrate). Bridges are natural choke points to vehicles. The Army FM for obstacles gives some great expedient ideas for obstacles but it’s generally a good idea not to get too crazy with obstacles outside of your point defenses. And remember: Obstacles normally will not completely halt a threat. They normally only delay a threat and allow you more reaction time. Plan for obstacles not directly in your field of view being cleared faster than ones you can fire upon. And obstacles work both ways. Normally you will want an AO that encompasses all of the homesteads in your small rural community. Avoid the temptation to keep expanding your AO to bring in more folks – reaction times dictate you need to be able to get to any of the homesteads within a few minutes from yours. So we’ve examined our maps and satellite photos and decided what our AO is going to be. This is a satellite view of the area I used to live in. Take a look at it and then reference the legend below it to see what we came up with. The large Yellow circles represent either individual or clustered homesteads. Notice in the very center of the AO we have a church. Those church bells can be heard from any location in our AO (an added bonus). The Orange outline is the outer boundaries of our AO. At no point can any location along that boundary either observe or fire upon our point defenses. 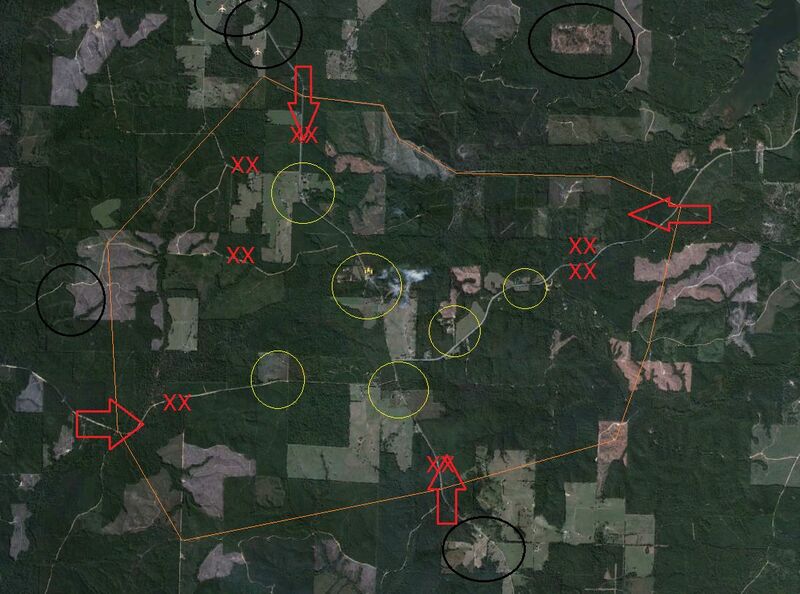 The Black circles represent adjacent terrain or features that more probably than not will have impact on our AO. Remote airfields, homesteads outside of our AO that aren’t necessarily friendly, open areas large enough to marshal. The Red arrows represent avenues of approach into our AO. In this case our AO had two issues: A paved county road running North to South and an unimproved dirt road that runs east to west. There are other avenues but generally all of them run into the main ones. The Red X’s represent planned obstacles. In all cases these roads could be blocked quite easily using a chainsaw to create a complex abatis. If we were forced to leave one route open we would leave the southern approach open however restrict the lanes so that no vehicle would be able to make a “fast dash” up the road into the middle of our AO. For further restriction we could even create more abatis on the roads outside of our boundary. Our Key Terrain is encompassed within the point defenses (our homestead areas). remember those circles – they’ll come back later on. Once again: This is by no means a super complex plan. It’s also not by the books .mil. The intent is to present a plan for the reader to examine. Remember – this isn’t geared to .mil types, but rural farmers and ranchers. For those so inclined to read further in depth HERE is an excellent Introduction to Terrain Analysis. This entry was posted in Security Planning, Situational Awareness and tagged defense planning, hardening AO, homestead defense, Rural defense, SHTF. Bookmark the permalink. Thanks for all you are doing with this education stuff.